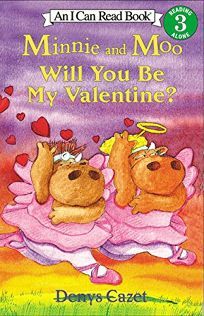 The bovine buddies are back to share their love in Minnie and Moo: Will You Be My Valentine? by Denys Cazet. From Moo's ""Ode to the Cream Puff"" (inspired by a mishap that sends Minnie's pastry into her lap) to some misdirected love poems that cause a hubbub in the barnyard, this new beginning reader adventure will once again win the affections of Minnie and Moo fans.